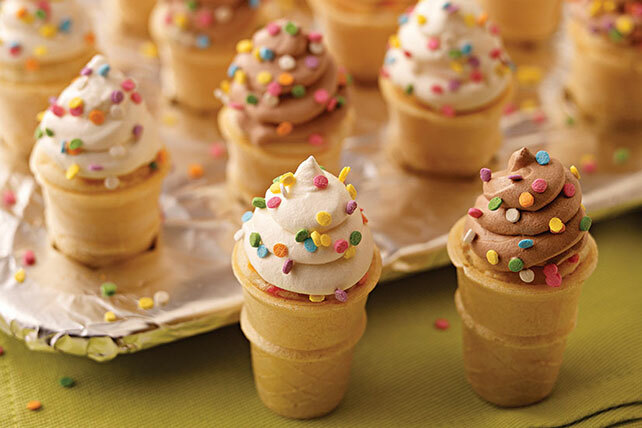 Bake these adorable Mini Cake Cones for your next party. Our Mini Cake Cones are cupcakes made in ice cream cones and finished with a vanilla topping. Prepare cake batter as directed on package; stir in 2 Tbsp. sprinkles. Cover tops of 2 mini muffin pans with foil, pressing edges of foil around edges of pans to secure. Use sharp knife to poke small hole in foil over center of each muffin cup. Place bottom of 1 ice cream cone over each hole, then carefully press cone through foil so cone stands upright in muffin cup. Spoon cake batter into cones, filling each about 3/4 full. Bake 12 to 15 min. or until toothpick inserted in centers of cupcakes comes out clean. Cool completely. Spoon frosting into medium bowl. Add COOL WHIP; whisk until blended. Spoon into resealable plastic bag; cut off one bottom corner of bag. Use to pipe COOL WHIP mixture onto cupcakes to resemble swirled ice cream. Top with remaining sprinkles. To prevent overbaking, check cakes or cupcakes at the minimum baking time indicated in recipe. Insert a toothpick in center of cake. If it comes out clean, the cake is done. If it does not come out clean, return to the oven for a few additional minutes before rechecking. If you can't find mini cupcake cones, you can use regular ice cream cones and standard-size muffin pans instead. Prepare recipe as directed, using 24 ice cream cones and increasing the baking time to 18 to 21 min. or until toothpick inserted in centers of cupcakes comes out clean.